Imagining life on an island conjures up images of white-sand beaches, the warm ocean and the whir of an overhead fan gently stirring the breeze. But when the fan stops running because there isn’t enough energy to power the island for the day, the warm weather can become hot and the experience can become less pleasant. Annobon Province in Equatorial Guinea is home to 5,000 residents who live and do business on the island. It is a volcanic island characterised by lush valleys, steep mountains, luxuriant vegetation and increasingly unreliable electricity. On a good day, this tropical paradise is lucky to enjoy five hours of power. The remainder must be supplemented by generator power at a considerable cost to residents and businesses. This is all about to change as Africa’s first and largest self-sufficient solar micro grid is being installed on the island. The programme is part of Equatorial Guinea’s Horizon 2020 programme. Horizon 2020 is the government’s plan for the future that seeks to diversify the economy and put in place the necessary infrastructure to build a sustainable future. MAECI Solar, GE and Princeton Power Systems are installing a five mega-watt solar grid across three locations on Annobon Province, including the airport, hotel and mountain top. The island-wide micro grid will provide reliable, predictable power and meet 100 per cent of current energy demand. As energy requirements increase, extra storage batteries can be added. It will be the largest self-sufficient solar project in Africa. Chris Massaro, senior vice president, MAECI said the solar farm project will add 700-1,000 direct and indirect jobs to the island and significantly raise the standard of living for locals. 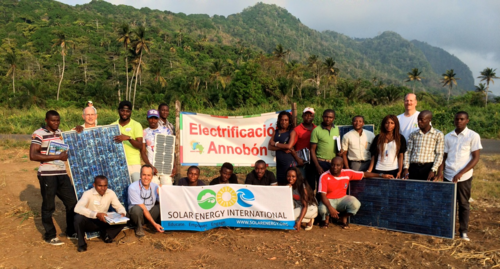 The long-term goal of the programme is to create a self-sufficient solar grid that can be run, maintained and serviced by residents of Annobon Island. Twenty engineers have so far participated in the first round of training focussed on the installation and maintenance of the grid. A second training course will commence later this year. With a second grid planned for a neighbouring island, discussions are underway about creating a dedicated training centre at the National University of Equatorial Guinea. The aim is to develop a dedicated technology hub to service similar projects across sub-Saharan Africa. “While this small island may seem far away, there is global significance in the project. Self-sufficient solar farms can be installed in other geographically remote areas even if they are not able to link to major power grids. Through harnessing and specifically storing solar energy we can now provide reliable power to some of the world’s 1 billion people who are without electricity. This power will enable these areas to have crucial services like hospitals and lighting” said Wyatt. In the developed world, electricity is a fact of life and often taken for granted. But it is in the developing world that the transformative power of reliable, cost efficient solar-powered electricity is enormous. Through consistent power supply, communities such as Annobon Province in Equatorial Guinea have the opportunity to transform and diversify their economies and improve the quality of life for all those living on the island.